I am excited to share with you the skincare line, Airelle. They offer a line of products that contain the proprietary ingredient Berrimatrix. This ingredient is made from the little miracle blueberry - that’s been shown to help block environmental infrared radiation. It supports your skin at a cellular level which prevents the signs of aging, while it helps repair the damage that’s already been done. 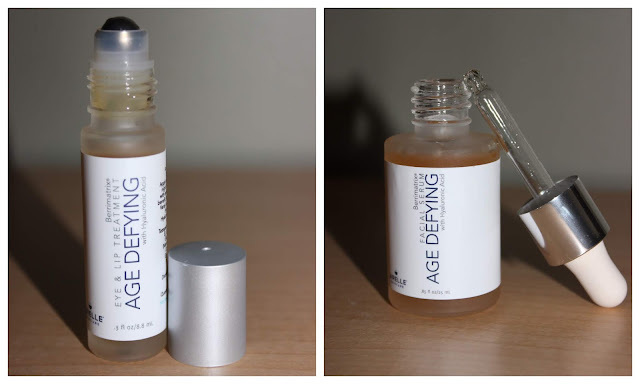 Airelle was kind enough to send me two different products to review: Airelle Age Defying Eye & Lip Treatment and Facial Serum. Airelle Skincare line was founded by TV Director Stephen D’ Amato and his Aesthetic Dermatology Physician Assistant wife Kasey Drapeau D’Amato. They scoured the globe for the most innovative and effective natural ingredients and recruited a team of the world’s leading dermatological scientists and formulators. Their mission was to develop a line of fast-acting anti-aging skincare products that help improve the appearance of fine lines and wrinkles, and protect your skin. The Airelle Age Defying Eye & Lip Treatment ($68 MSRP) helps target so many concerns we have when it comes to aging. It helps with; tired looking eyes, dark circles under the eye, crow’s feet and wrinkles around the eyes, lip wrinkles, smile lines, and forehead lines. I love that this product comes in a glass tube with a stainless steel roller ball. I use this product twice a day; morning and night. It glides onto my target areas with ease. The roller ball application helps with product waste, which can be left behind on your fingertips. Plus, there is a more precise application. The feel is more oily than creamy, which I really like. My eye and lip areas are feeling and looking much better. It has been only a few weeks but these areas do feel smoother. The appearance of my crow’s feet and smile lines have improved. The next item I had the opportunity to try was the Airelle Age-Defying Facial Serum ($158 MSRP). I love that a little bit of the product covers your whole face and neck. A little does go a long way. This targets many issues; fine lines, wrinkles, dark spots, and clarifies acne prone skin. This product also is oily and not creamy. Yet, it blends into my skin with ease. I love to use this product before applying my makeup. It makes my makeup look smoother plus it seems to help it last longer thought out the day. The bottle and eyedropper both are glass. I am loving both of my Airelle Skincare products that I received. I couldn’t be happier with the results I have received in only a few weeks.